If you are one of the many people who have needed a filling in their front, most visible teeth, then you likely know how easy it is for people to see that filling. 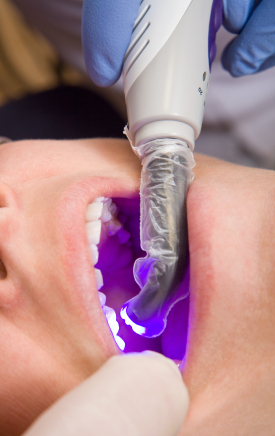 You have the option at some dental offices for darker fillings, or you have the option for lighter-colored fillings. If you have the option to go with tooth-colored fillings, also called composite fillings, then you should. It can really help you feel better about smiling in front of others. Smiling with a lot of dark fillings visible can really make you embarrassed to share your smile. When you have a filling that matches the color of your natural teeth, they blend in. They are very difficult to detect outside of someone doing a full oral examination. Your dentist will be able to tell the filling is there, but you simply smiling at a friend or smiling during a business meeting, no one is really going to be able to tell the difference. Instead of hiding your smile so people don't notice your fillings, opt for composite fillings. They blend in, and let you show off that smile while you are doing anything without worry or fears. They typically do not cost much more, if any more, to put in at your dentist's office. This makes them the perfect solution for any cavity that is going to be easily seen. Contact our office about what filling options you have before having your filling put in. They can explain to you what options they offer, and you two can decide what the best options are for your situation. Each type of filling has pros and cons, so make sure you know the best route to take for you before getting your next filling done.